American Football has a much longer tradition in Japan than in Europe where league competition did not start until the end of the 70's. The history of American Football in Japan goes back to 1934 when Paul Rusch, a teacher and missionary from Kentucky (USA), who came to Japan in 1925 to help rebuild the Yokohama and Tokyo YMCAs that were destroyed in a 1923 earthquake, George Marshall, an athletic teacher at Tokyo based Rikkyo University, and two military attaches at the US embassy, Alexander George and Merritt Booth, helped to form the first football teams at three universities in Tokyo (Waseda, Meiji, Rikkyo). In November of 1934 the first football game was played between an all-star team of the three Tokyo universities and a team of the Yokohama Country and Athletic Club consisting of Americans and Britains living in Japan. The japanese college team won the game. American Football quickly gained popularity in Japan. In 1937 a game between college all-star teams from eastern and western Japan drew a crowd of about 25.000 spectators. The reason for the success of the rough north american game in mild-mannered Japan might be that American Football offers a combination of power, technical precision, discipline and team spirit that is hard to find in other sports and that most parts of this combination (precision, discipline, team spirit) match well with traditional japanese values. During World War II (1939 - 1945) American Football in Japan came to a halt. Rusch, the »Father of American Football in Japan«, had to leave Japan. Soon after the war American Football in Japan resumed. Rusch returned to Japan in 1945. During the following years High School and Junior High School teams were formed. Today more than 17.000 players participate in competition for about 400 teams. The biggest number of teams and players compete in college football. Like in US college football players in japanese college football have four years of eligibilty. There are two college football leagues, the Kanto League with teams from eastern Japan and the Kansai League with teams from western Japan. Each league has different divisions. The Division I of the Kanto League has two Conferences (A and B). The champions of the two leagues battle for the college championship in the Koshien Bowl in December. The highest level of American Football in Japan is the X League, consisting of true company teams and club teams sponsored by companies. The company league was founded in 1981, since 1996 it is called X League. The X League is an amateur league meaning that the players do not play for money. Like the college leagues the X League has different divisions. The Division I has three regional division (East, Central, West). The two top teams of each division advance to the playoffs, called the Final 6. The championship game is called Japan X Bowl and is held in December. The X League champion then plays against the college champion in the Rice Bowl on January 3 for the japanese national championship. The Rice Bowl used to be a game between college all-star teams from eastern Japan and western Japan. Since the 1983 season it is the national championship game. The X League does not offer the highest level of play in Japan. In fact, of the 23 national championship games (through the 2005 season) twelve have been won by the X League champion and eleven by the college champion. Matsushita Denko's national championship in the 2004 season was the first for the X League after three straight titles for the college champions. 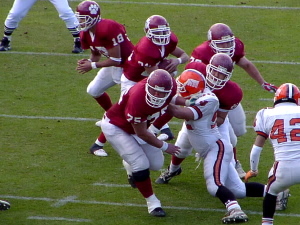 Koshien Bowl 2003, are two of the top teams in japanese college football. rewritten or redistributed without the written consent of www.american-football-japan.com. is not responsible for the contents available on these sites.